Just outside of Healdsburg, Dry Creek Road runs like a ribbon through the heart of Sonoma County’s Dry Creek Valley. 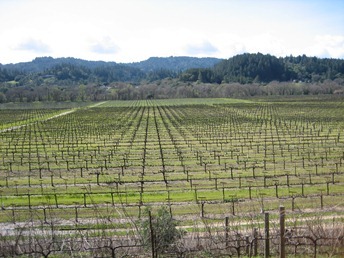 Dotted along its length are several award-winning wineries. Wilson Winery is perched at edge of the road, with the tasting room at the back of the old barn. This might not sound promising, but their patio is the perfect spot to enjoy a wonderful glass of wine as you take in their sweeping views of Dry Creek Valley and its row upon row of grapes nestling into the hills. 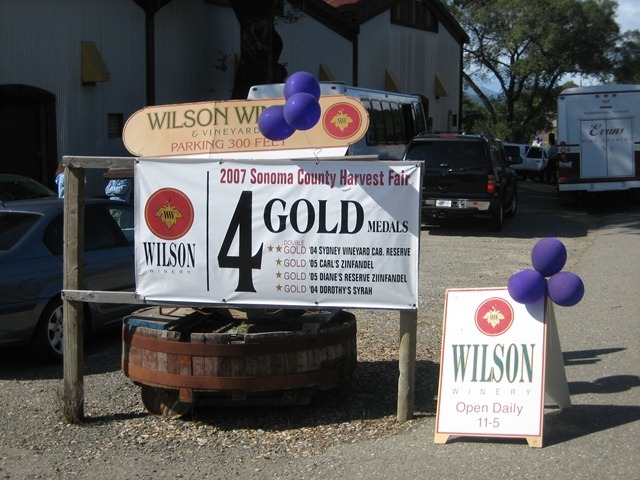 Wilson offers a variety of different wine, including Zinfandel, Cabernet Sauvignon, Cabernet Franc, Syrah and Merlot. The winery is truly a family affair. Each of their vineyards is named after a different member of the family. The tasting room is decorated with photos of the family and their beloved dogs. 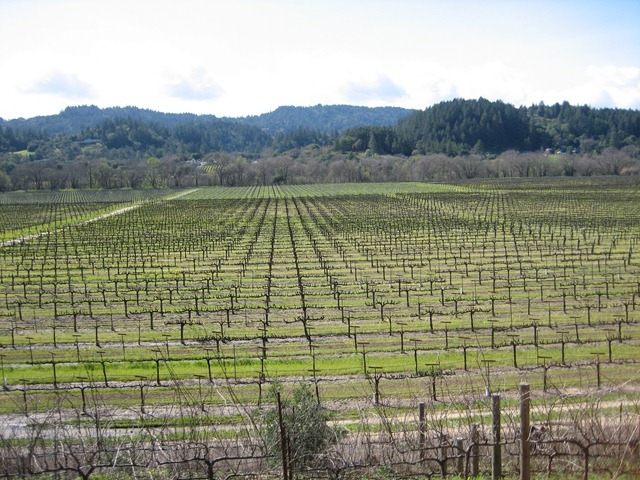 This is real Wine Country – wine is the family business. For Barrel Tasting, Wilson sets up a BBQ. The line up is always long, but with these views to enjoy, who cares! When you’ve grabbed your food, you can head to the cellars to taste the wine right out of the barrels – while you’re surrounded by them! Don’t forget to add your tally marks to vote for your favorites – they keep a scoreboard handy for your input! Such a great recommendation! We took Dry Creek out of Healdsburg (after a lovely lunch at Barndiva) in July ’08 and made Wilson our first stop. We could have stayed all afternoon on Wilson’s patio, looking at the view of their vines (love your photo!). Strolled out of there with a few gorgeous bottles of cab franc and zinfandel…but now I want to go back ASAP for one of their BBQs. Thanks! The beautiful scenery makes it easy to get a good photo! 03/06/2010 & 03/14/2010 – 32nd Annual Barrel Tasting! 🙂 It’s a great vibe! Definitely adding this one to our list when I come up to Sonoma sometime next year! You have some great suggestions that we will definitely check out. We ran out of time this trip (only 1 1/2 days in Napa as we had to pick stuff up). I really love family owned/run places – will take the any day over big corporate impersonal wineries!